Human hearing is differently sensitive. We hear basses and trebles lower at low volumes than at higher volumes. The most sensitive is our hearing at approx. 3.5 kHz. In 1933 two employees of Bell Labs, Dr. Flechter and Dr. Munson found out. 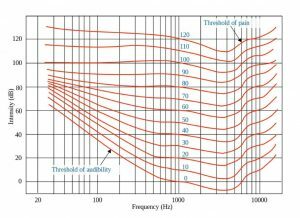 In a long-term study, the hearing of many people was examined for the sensitivity as a function of frequency and loudness. Four years later, the so-called Flechter-Munson-curves were published, in which the results of the study were presented graphically. It sounds a bit theoretical and complicated. What does this mean for amplifying the Axe-FX, Kemper and Co.? Actually, nothing else, except that you should program your presets in the volume and listen as they are heard by the audience. If you program sounds at a low volume, you automatically turn too many treble and basses because our hearing is very different and so leads us astray.